Oracle Fusion Middelware application delegates user authentication to the first authentication provider configured for the domain. Each authentication provider as a Login Module. Authentication provider provides information to the identity store. By default, an installation is configured with an Defaultauthenticator that uses the Oracle WebLogic Server embedded LDAP server for user and group information. or another LDAP server for authentication. 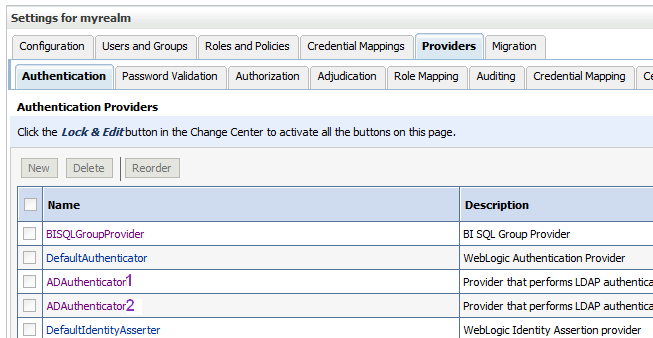 In this case, Oracle WebLogic Server Administration Console enables you to view the users and groups in your directory. However, you need to continue to use the appropriate tools to make any modifications to the directory. For example, if you reconfigure Oracle Business Intelligence to use OID, you can view users and groups in Oracle WebLogic Server Administration Console but you must manage them in OID Console. contains the authentication provider configuration. OBIEE 11g: Authenticating to Oracle Business Intelligence Enterprise Edition 11g With Users in LDAP, Groups in Database (BISQLGroupProvider) For the dataSource name whilst configuring the BISQLGroupProvider, you must provide the JNDI name rather than the Data Source name.